DESCRIPTION FROM THE PUBLISHER: 6:00 a.m. Wake up. Have two eggs for breakfast. This is how Bob, the Man on the Moon, begins his day. 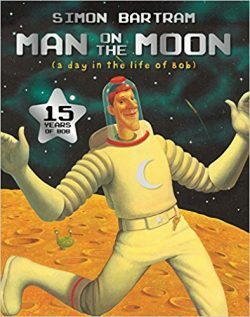 It’s Bob’s job to entertain the tourists (handstands and high moon jumps are a hit), conduct Moon seminars (how long does it take to walk around the Moon on stilts? ), sell souvenirs (pens, postcards – the usual), and keep the Moon clean and neat. Some people say that aliens are the ones who leave all the trash, but Bob tells them aliens don’t exist, and he would know . . . wouldn’t he?